Man, that stuff is really nice to listen to... Just goes to show that less is more sometimes. PSS forever! Gear: HS-60, MG-1, CS-5, ESQ-1, CZ-101, DR-110, MR-10, MDP-40, EA-1, ER-1, ES-1, Trixer, SDS-9, Califorian 365, toys, guitars, ukes, etc. Tyler2000 wrote: I though you said you wanted a microkorg as your next toy. Oh, and just curious, where about do you live? I live in Northeast Ohio. I did notice the "hiss" inherent in these things, I actually find it quite charming - how about you guys? Bummer, I'm always trying to find other synth heads in alabama. After 4 or 5 years of searching, I've found two and I don't actually know them. Oh, and the microkorg is digital. You may have been confused by the phrase "virtual analog" which essentially means it sounds analog...i guess. The minikorg is analog. so what do I put down here now? Tyler2000 wrote: Oh, and the microkorg is digital. You may have been confused by the phrase "virtual analog" which essentially means it sounds analog...i guess. The minikorg is analog. I was confused by that, thanks for clearing that up. I still like the sounds the MicroKorg produces so I'll still buy it and play with it until I can afford a real analog synth. I really like the interface too, it makes for a much less daunting experience for a beginner like me. You may also be interested to know that if you turn up the modulation, feedback and the carrier and mod frequencies (if you can), sometimes under certain conditions, the tone will become wurbly and several if not all the notes will be quite out of tune. Its a pretty cool effect for weird electro arppegios, trills, scales, etc... especially with portamento. I like the build of the mini keys. They're not particularly special for mini keys, but they trigger easily for how firm they are, nice for trills and fluttery arppegios. Like most FMs, I'd say the best sounds you can get from these are bells and metallic/icy/glassy sounds. Decent pads, strings and organs, though the vibrato is too weak for expression. Fairly fat bass, but the low end drops out a bit, so if you're using it for bass, you'll have to turn up levels a bit. If the modulation is really low (softer sounds, more sinosudial) and I'm not playing any low, bassy notes, I transpose the keyboard up a whole octave, pushing the dropped out lows I'm not going to use off the keyboard. Toys: Casio PT-87, Casio SA-40 "Magical Dial", Casio Rapman, "The Crappy Keyboard"
immigrantboy wrote: I like the build of the mini keys. They're not particularly special for mini keys, but they trigger easily for how firm they are, nice for trills and fluttery arppegios. Yeah, I'm REALLY loving the feel of these keys. It's just fun to play. Some of you guys have suggested running this through some effects, what do think of this? I appreciate everyone's help so far, thank you all so much for your assistance and guidance. probably fine for the money. You could check out reviews at harmonycentral.com and see what other people think. the best pss-470's with the fm synthesizer stuff are the pss-470 and pss-570. imo. both have custom drummers that you can actually create unique patterns from..works just like a typical drum machine. hold delete-press a drum sound during playback to delete hits.. write in realtime., etc. the fm synths sound the best on these 2.. tho i think there's a larger (non-#70) model with more parameters. the 470 and the 570 are identical, both can synthesize from scratch or modify the existing presets. the 570 however, can also affect the auto chording and bassline sounds.. the 470 doesn't. i originally had a 570 and it was stolen years ago.. and i bought/have had a 470 since. i miss the bass/arpeggiator/autochord of the 570 tho..
both also have pretty good mixing facitities letting you turn off certain parts, octave range for the arppegiator, different patterns, etc. there's also a long release button called sustain which gives off a nice smooth tail and a stereo chorus. Is there much of a difference between the PSS-570 and the PSS-560? I know mine you can't write the beats, just use the sliders to adjust them. 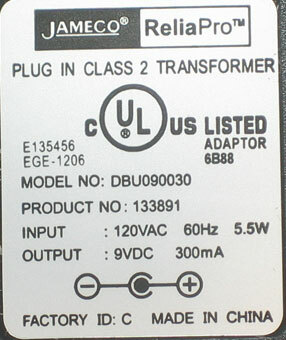 I'm still looking for a PA-1 or a PA-4 power supply for mine, do any of you guys know the difference between the two? Anyone have a spare just laying around? I've been spending a couple of hours a day with it, and I've managed to find some really cool sounds. I really love this thing. Cam VanDerHorst wrote: I'm still looking for a PA-1 or a PA-4 power supply for mine, do any of you guys know the difference between the two? Anyone have a spare just laying around? Almost any 9-12V POSITIVE TIPPED adapter that fits the socket will work. Yamaha went with positive tips while nearly everyone else uses negative tips. Look for the symbol like the one at the bottom of this picture to tell the difference. That means the tip is positive and the sleeve is neg. Does anyone know when the PSS-460 was produced? My first keyboard was a PSS-480, and I thought that it was far more capable than it looked. Yes, it was a home keyboard with mini keys, but the drum pads were handy (32 different sounds, touch sensitivity, rhythm programming) plus it had a nifty little sequencer/recorder and you could program patches. I've hung onto mine for years, but now I've upgraded my set-up I've room out of room, and it's going to have to go. I'll be sorry to lose it, but will always remember the 'board that got me into the world of synths. nice pss song..thank you for sharing this one. The connector for the power supply is not working, so I'm stuck with batteries. Any way to replace it?